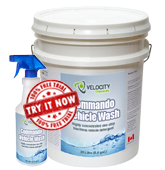 COMMANDO VEHICLE WASH is a highly concentrated and high-foaming product used for brushless pre-spray and wand wash applications for vehicle cleaning and degreasing. It is very effective in removing road film, bugs or insects and light oil or grease from mobile equipment or vehicles in heavy equipment shops, truck and car washes, railroads and mines. Safe to use on all metals when used at recommended concentrations. Brushless Pre-Spray – use at 1:80 (1.2%) to 1:25 (4%). Allow contact time of 2 to 5 minutes before rinsing with high-pressure washer. High Pressure Wand Wash – use at 1:360 to 1:80 (0.3% to 1.2% through tip), depending on surface dirt, water conditions and soil conditions. Rinse with water.